We had a productive week out on the water for both chinook and coho in a variety of locations, so let’s get right down to business. When the winds have allowed we have crossed the Strait of Georgia and fished Gabriola and Nanaimo and have done well. There seems to be a good number of fish around, which is a bonus, as some years it starts to dry up late June, but not this year. I fished there 3 days this past week and Khoi had some trips there too. We both did well on splatter back hootchies in green, chartreuse, and blue combined with the same colour flashers with glow tape (STS, Lemon Lime, Phantom). An added bonus are the coho. Just head out into 500-1000 feet of water and fish the top 100 feet of the water column with a chrome or UV flasher like Betsy, Green Onion, Purple Onion, and Yellow/Green Kinetic combined with a white UV hootchies or small spoon. There are also a few lings around, so you can make a good day of it fishing for chinook, coho, and lingcod. A nice Canada Day fish over at Thrasher. On this side of the pond we have been fishing a few different areas depending on the winds and the length of our trips. 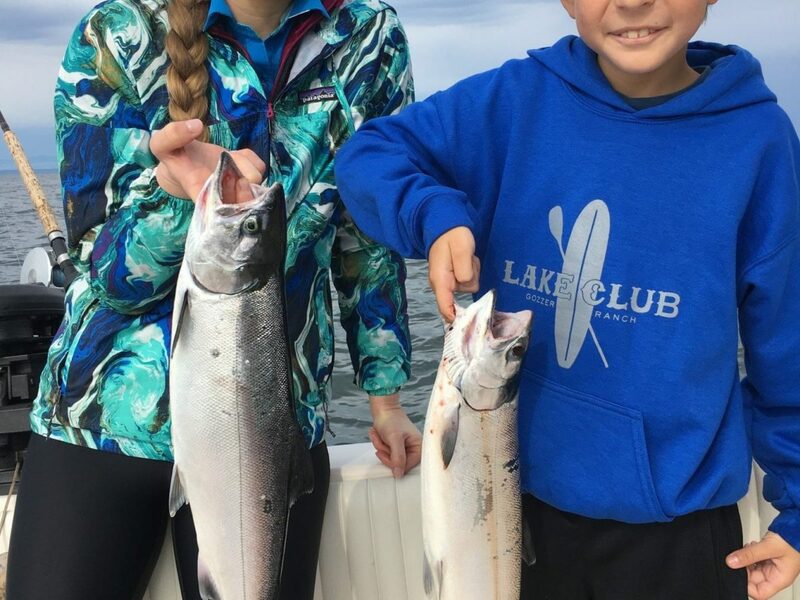 The coho fishing remains very consistent offshore of South Bowen, in and around the Hump. That area is about 3 miles offshore so you need to watch the winds. When we have been able to get out there the actions has been great with multiple bites and hook ups. The same flashers and hootchies mentioned above are working well and the fish have been from 90 feet and up on the riggers. We have hooked a few big springs while targeting the coho, so be ready for that! 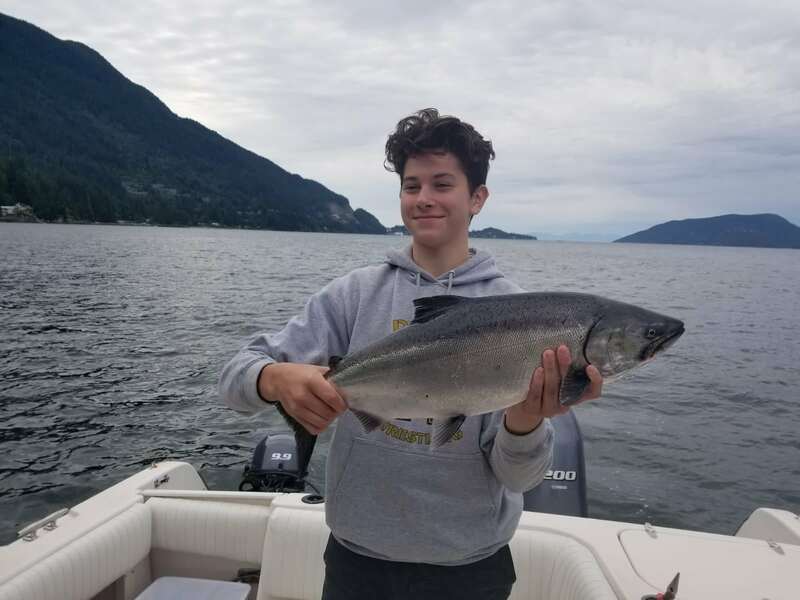 When the winds have kept us off the Hump we have been hiding up Howe Sound, mostly at Hole in the Wall and have had some decent action or chinook. Bait has been the best producer and productive depths have been 80-120 on the downriggers mid day, a bit shallower if you are there at first light. We have been hooking a mix of feeder chinook and mature chinook likely headed for the Squamish system. There have also been some coho off West Van. 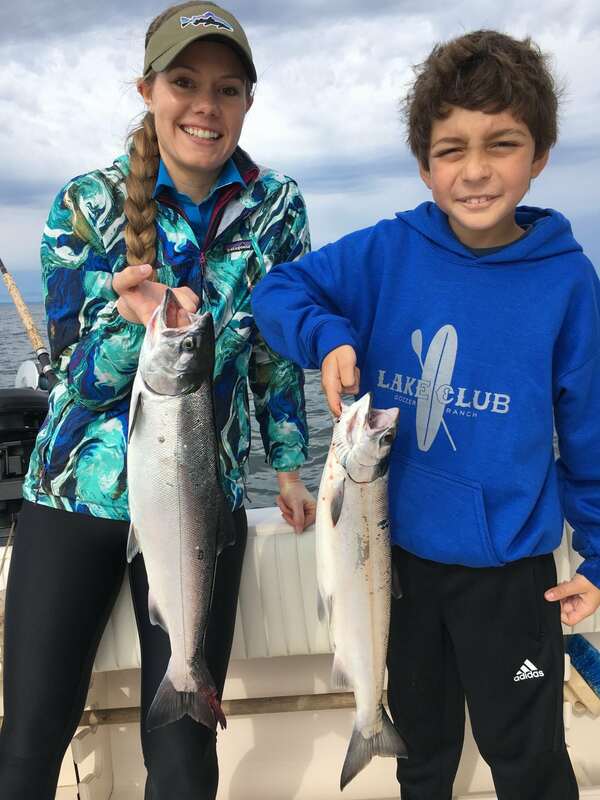 It isn’t red hot yet, but if you are looking to keep it super close to home it is worth the effort, as most boats that have put in a tide change have been into a few coho. For now the better action is definitely out on the Hump, but as noted earlier you need the weather and you need a decent amount of time to get out there. We are starting to see some decent chinook numbers in the Fraser River Albion Test Sets, so that tells me it is time to make a few passes at the Bell Buoy. Fish anchovies and keep your gear shallow, 40-70 on the riggers. We usually start fishing here in about a week or so and the fish are there one day and gone the next, with the more consistent fishing coming a little later on in late July and August. A good game plan is to hit West Van in the morning for coho and then fish the Bell Buoy for chinook later in the day. Crabbing is slowing down, but we are still dropping traps as we have had some good success in a few select spots. Conveniently located in downtown Vancouver in the Heart of Outdoor Row. We have a large selection of gear for all your fishing needs. ©2015 Pacific Angler Charters. All rights reserved.